In three issues of Jep Comix, Jeff Clayton divides his efforts between two stories – “Little Dead Kid” and “The Valley of the Shadow of Death.” “The Little Dead Kid” is a charming storyline about a child that dies and finds himself barred from both heaven and hell. So, he becomes a super hero on Earth. On Earth, he spars with rats, befriends cats, and tries to do good. “The Valley of the Shadow of Death” is a continuing saga of a human, his robot, their old pal, Duke, and a mysterious group called the Jitkes. You don’t find out about the Jitkes until the third issue, and even then the tale ends in mystery. Jeff’s figure art is stripped down to the very basics then superimposed over computer generated backgrounds. 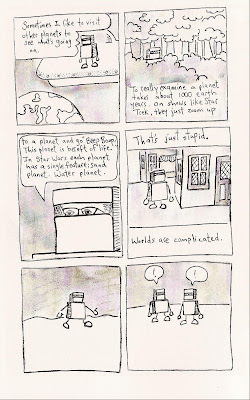 The art is one or two steps removed from stick figure art, but the simplicity doesn’t distract Jeff’s comics from being entertaining. 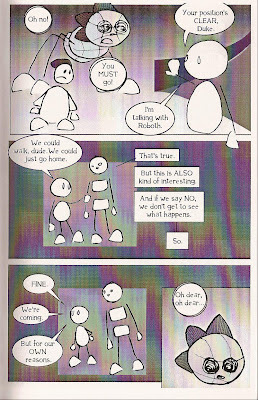 The Dead Kid stories are more organic than the Valley stories, and they meander among topics to fit Jeff’s mood at the time. Here Jeff has fun and flexes his sense of humor. Dead Kid stops a “rumble” between a gang of rats and flies. Dead Kid chastises people for using guns, when swords are much more precise. 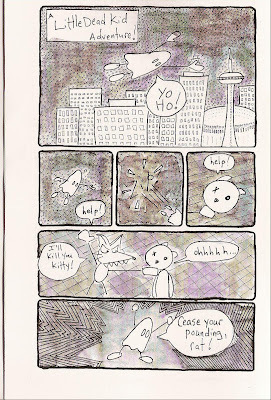 Check out Jeff’s Jep Comix at his website. 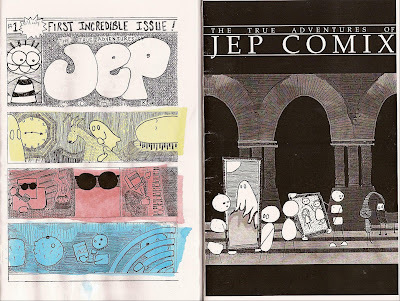 He's currently offering a triple pack collecting the first three issues of Jep Comix for an unheard of 35 cents. That's just crazy.